Bake biscuits as directed on can. Cool completely, about 20 minutes. Split warm biscuits. 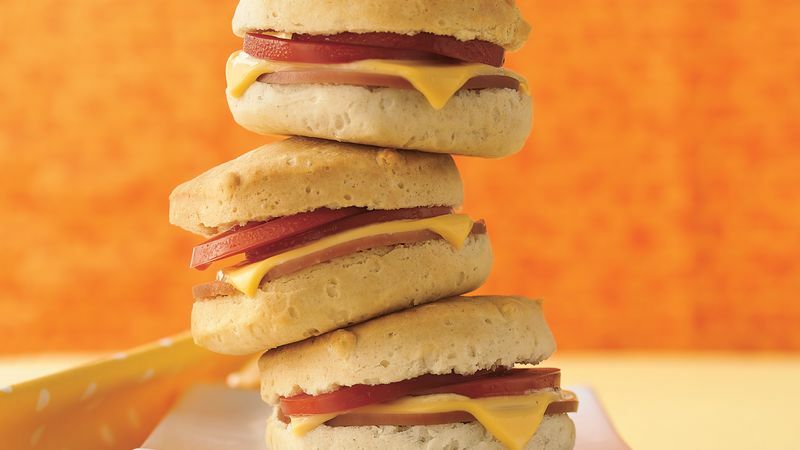 Fill each with 1 slice Canadian bacon and 1 slice cheese cut to fit. Wrap sandwiches individually in microwavable plastic wrap. Place in large resealable freezer plastic bag; seal bag and freeze. For best quality, use within 3 months. To heat 1 frozen sandwich, loosen wrapping. Microwave on High 45 to 60 seconds or until thoroughly heated and cheese is melted. Let stand 30 to 60 seconds to cool slightly before serving. Add tomato slice to each sandwich. Slices cut from a loaf box of American cheese or deli slices that aren't individually wrapped work best in this recipe. It works best to microwave the sandwiches one by one. Start with the minimum time and check the middle of the biscuits before adding more time.